Due to our enormous familiarity of the market, we have managed to become the principal providers of Evening Bag. With the efforts of our professionals, we are able to manufacture superior quality Embroidered Bags. These Embroidered Bags are made from high quality of raw material which ensure durability at its user end. These product are available in market at competitive rates. - Customized Hand embroidered Evening Bags, Purses. 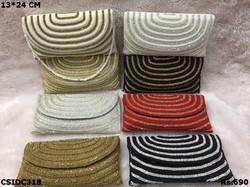 Our company has achieved widespread recognition in offering Jute Evening Bag to the clients. Jute Evening Bag is widely appreciated for intrinsic quality attributes such as easy to wash, non-shrinking and availability in varied colors. This product is known for quality and prolonged life by the esteemed customers. Our collection of Evening bags is available in different shapes, sizes and patterns. These bags are very light and crafted espically for a soothing evening. An excellent quality range of Hi-Fashion Evening Bag, our clients can avail from us. This range of Evening Bag is known for its best quality and durability. Clients can avail from us this range of Evening Bag at most affordable prices. 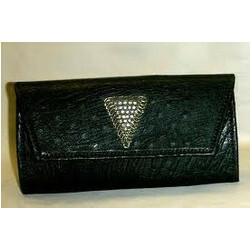 We are engaged in providing Ladies Evening Bag in the most attractive designs. These party collections are known or their unmatched varieties, colorful patterns, attractive designs and superior quality. Procure from us flawlessly stitched Elegant Designer Bags that are known for their quality, eye-caching designs and fine fabrics. Available in attractive colors, patterns and styles, our range of Designer Bags is highly demanded. Our team of designers makes use of latest machinery to ensure quality stitch and durable make of these bags. Bag Size In Inches - Full Height: 32.5", Bag Height: 11.5", Length: 13.5", Width: 0", Strap Length: 32", Strap Width: 3"
The exclusive range of evening bag fulfills the requirements of the clients. These are provided with variety of designs and patterns and are offered at optimum prices. Apart from this, we are also providing customized solutions as per the requirements of the clients. We have designed and developed evening bags which have been hand craffted to provide them a beauty and attractive appeal. This bag easily matches with any apparel and is available in varied sizes, patterns and shapes. This bag is completely handy to carry and is offered at competitive prices. Big Shoulder bag with Jute and metal fitting.